Physical therapy – it can do a lot to help people adjust after a life-altering injury or disability, and it’s also a useful way to support health and wellness. It can improve mobility, relieve pain, and support the general functioning of bones, joints, and muscles, as well as help strengthen other physical systems. If you have an injury or medical condition that makes it hard to get through daily tasks, like feeding yourself, bathing, getting dressed, moving around, or going to work, physical therapy can help. The goal of physical therapy is to strengthen weak muscles and joints, and improve function, to help you get around better, be more independent, and enjoy life more. Whether you’re an elderly person recovering from an injury, a new mother healing from giving birth, an athlete coping with an injury, or a person who’s recently had surgery, physical therapy can support your return to health. Physical therapy is often used for pain management, but it’s also a common part of the rehab process after a surgery, stroke, or heart attack. For example, if you’ve had a heart attack, your physical therapist might give you heart-strengthening exercises that are tailored to your current fitness level. If you’ve been recently fitted with an artificial limb, a physical therapist might coach you in the best ways of using that prosthetic until you get used to it and are able to use it to its full advantage. These days, more people than ever are benefiting from physical therapy. Between the year 2000 and 2008, the number of Americans receiving physical therapy ballooned from 1.2 million per day to 1.6 million per day. That’s because more and more Americans are seeing how physical therapy can help them continue to enjoy an active lifestyle. 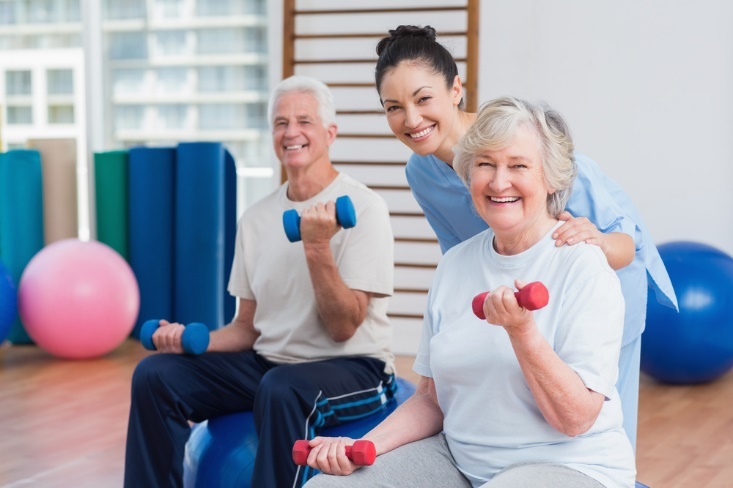 Many younger, active people are using physical therapy to stay active as they heal from sports injuries, recover from surgeries or medical conditions, or simply work to prevent future injuries. In the past, doctors used to prescribe rest to patients recovering from injuries and surgery, but while it’s important not to overdo it while you’re recovering, the latest research shows that too much inactivity during a recovery period can do more harm than good. Let’s say you sprain your knee, and decide to take it easy while you’re healing. Not only can too much rest leave the injured joint permanently stiff and weakened, it can also mean that you’ll end up in worse overall physical shape because you’re not exercising. Besides, true recovery means more than just letting an injury heal. Physical therapy seeks to address the underlying causes of your injury or condition, which can often include an insufficient fitness regiment or substantial weakness of one or more parts of the musculoskeletal system. That’s why physical therapy is useful for helping athletes recover from sports injuries, or elderly people improve their balance. Therapy targets weak parts of the body, strengthening them to support healing and prevent further injury. Let’s say, instead of staying off your sprained knee until it heals, you see a physical therapist instead. He or she might deduce that weak hip muscles on that side of your body contributed to the injury by placing too much stress on the knee joint. By using physical exercises to strengthen those weak hip muscles, the knee is supported in its recovery, and the cause of the injury is addressed. You’ll be less likely to hurt your knee again. The joint will stay limber and get stronger faster, and because you stayed active during your recovery, you won’t be as out-of-shape when you return to your regular exercise routine. Physical therapy can even be used to prevent injury, by addressing imbalances or weaknesses in the body before they cause harm. Many physical therapists offer preventive evaluations designed to target potential causes of injury before they develop into something serious, so that you can avoid torn hamstrings or slipped discs altogether. If your doctor has recommended physical therapy, or you’re simply looking for a drug- and surgery-free way to live a healthier lifestyle, you need to book a consult with a physical therapist. Physical therapists use exercises and lifestyle changes to support your body’s overall health and functioning, to help you live with more mobility, less pain, and a greater sense of well-being.